ImageJ SAMP plug-in Turns ImageJ into a VO image viewer, and provides the VO with high level image processing and conversion functions (DIO/PADC, ObsParis). New telescope list Will be coupled with the matrix of ground-based telescopes (input system from Europlanet FP7) and a coordinated ground-based observation system with 3D visulization. Data service validator Checks the interfaces of a data service, testing various protocols. 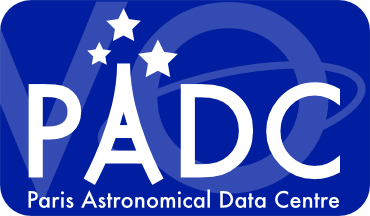 Includes EPN-TAP v1 and v2, and PDAP (DIO/PADC, ObsParis). Object resolver SSODNet name resolver for Solar System objects (IMCCE/ObsParis). Used for name completion and extended searches in the VESPA portal. Miriade Web form VO-compliant ephemeris service with visibility charts (ViSiON) - (IMCCE/ObsParis). SSHADE Portal to several databases in solid phase spectroscopy, with plotting tools (IPAG/Grenoble). iPECMAN Analyser of multi-dimensional measurements of planetary electromagnetic fields (IAP-CAS, Prague). LecturePDS PDS3 reader for IDL & GDL (LESIA/ObsParis). IDL_VOtable VOtable reader and writer for IDL & GDL (based on STILTS library / TOPCAT), LESIA/ObsParis.